It is that time of year when the transients and winter residents are up north, and most of the summer and permanent residents are nesting. Goldfinches, for example, will not start nesting for another month or so, while some young Robins have already fledged. Considering the cold and late spring, I was surprised to see a nearly full grown young Robin in our yard yesterday, Sat. June 4. I guess, weather notwithstanding, birds will do what birds have to do. Also, it is time to move away from the backyard birds for awhile and concentrate on birds in the rural areas where most birds and most species do occur. For this summer I plan to start with birds that live in and around water. This week, I want to cover a small wader that is a common summer resident in our area, but is often overlooked. The Spotted Sandpiper is about midway between a sparrow and a Robin in size, and of all the little brown waders, of which there are several, it is the only one that is actually quite easy to identify. What simplifies matters even more is that males and females are the same. 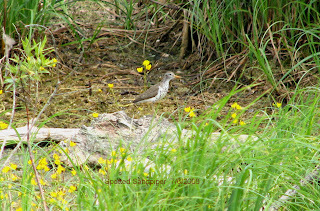 A Spotted Sandpiper has three distinctive characteristics that, when taken all together, give it a unique appearance. First, it has a whitish breast and belly that is covered with rather evenly spaced black spots, hence its name. Second, while standing it constantly teeters. That is, the part of the body forward of its legs jerks upward, while simultaneously the back part dips downward. A few other sandpipers, also, exhibit this behavior, but not to the extent that the Spotted Sandpiper does. Third, it has a very distinctive flight pattern. It flies on rapidly beating wings that are held out stiffly with most of the motion in the wingtips. Locally, only Eastern Kingbirds and Bobolinks have a similar flight pattern and neither one is a wader. The latter two have declined in numbers in recent years, although, the kingbird is still quite common locally while the Bobolink has always been a bit of a rarity. Spotted Sandpipers winter in the extreme southern USA and in Mexico where they can be readily found on the shores of the Gulf Coast. One word of caution to winter vacationers is probably in order here. In their winter plumage, Spotted Sandpipers lose their spots and can only be identified by their other characteristics. Like several other birds, the Goldfinch for example, the sandpiper’s name is only appropriate in the summer time. This is also a good thing to remember in the early spring when some of the returning birds have not completed their molt into summer plumage. Spotted Sandpipers do prefer somewhat larger bodies of water with sandy or gravely shores, but are not overly particular. This week’s photo, for example, was taken on the grassy shore of a slough just off the grid road several kilometres east of town. If, for some reason, one of you happens to be near a slough and there are small wading birds present check for the Spotted Sandpiper. There is a good chance one will be present.